Games can be freely passed on to friends, Microsoft added, but only once. “Xbox One is designed so game publishers can enable you to give your disc-based games to your friends,” the statement said. “There are no fees charged as part of these transfers. The Xbox One will come up against Sony’s new console, the PlayStation 4. Sony is yet to show off the console and has not set out its policy on pre-owned games. Its worldwide studios president, Shuhei Yoshida, told news site Eurogamer that used games would not be “blocked” on the console, but would not specify whether there would be a fee for using pre-owned titles. The Xbox One has also come under fire after it emerged it might have to be always online to play games. Microsoft explained on Thursday that while the console did not have to be online to play, it did need to connect at least once every 24 hours. This policy would “raise a few eyebrows” in the gaming community, one technology blog wrote. But Microsoft argued that these policies allow individuals greater access to their games, even if players are not on their own console. As the console is always on, it allows developers to create “massive, persistent worlds that evolve even when you’re not playing”, Microsoft said. President Obama and Chinese president Xi Jinping will meet this weekend to talk cybersecurity, among other things, but there are plenty of people on either side talking already. A day after China’s claim that it has “mountains of data” proving U.S.-based hackers have been attacking the Middle Kingdom, United States intelligence officials say they have reason to believe Chinese hackers orchestrated “a massive cyberespionage operation against the 2008 presidential campaigns” of Obama and John McCain. As part of China’s 2008 hack attacks, a private correspondence between McCain and the president of Taiwan was also thieved. As a result, Randall Schriver, who was serving as a top McCain adviser on Asian policy, received a call from a Chinese official complaining about the letter — before it had been delivered. The intrusions had been reported previously, but U.S. officials had never so explicitly pointed the finger at the Chinese government as being responsible. Doing so now further spices up this weekend’s summit between Xi and Obama. It’s looking less and less likely that this will go away. Apple used its influence to gain preferential treatment from mobile operators, a former senior executive at a major European operator told The Guardian. The claim comes on the heels of the European Commission’s announcement that it was probing Apple’s tactics. The probe included a questionnaire sent to mobile network operators throughout Europe and investigated whether Apple forced dodgy distribution terms on potential carriers. If these operators answered questions the same way they talk to reporters, it could spell a full-blown investigation, which, as Microsoft and Google can attest, isn’t always fun. Apple says its contracts fully comply with EU law. One thing potentially working in Apple’s favor is the definition of “dominance.” Researchers have pegged Apple’s share of the European smartphone market at 22 percent — well below the 40 percent threshold typically used to define dominance. That, by extension, makes it difficult for Apple to abuse its dominance. Justice ministers from all 27 European Union members states agreed Thursday to a proposal that will allow companies’ use of personal data to be scrutinized by regulators. The agreement was described as “business-friendly” by The New York Times, which said that the agreement is far less stringent than measures proposed more than a year ago. The Times credited an intense lobbying effort for the “softening” of original proposals. The final version of the legislation will not be done for several months — perhaps not until 2014. The Viber messaging app service has been blocked in Saudi Arabia, according to Talmon Marco, the head of Viber. Earlier this year, Saudi authorities had warned Viber and other encrypted messaging services that unless they allowed monitoring, they would be blocked. Viber didn’t comply, and it looks as though authorities stuck to their guns. WhatsApp and Skype also received warnings from authorities, but thus far neither has been blocked. Aside from the mega camera, the EOS is likely to be very similar to other Lumia models in most aspects. We previously reported that the phone would rock a 4.5-inch AMOLED screen with a 1280 x 768 pixel display, which is de rigueur with many Windows phones. Powering the device will be an unspecified quad-core processor, and it’ll hold as much a 32GB storage, though we’re not sure whether there will be a microSD slot or not. Since many of the leaked Nokia photos in the recent past have come to fruition, there’s a good chance we’ll be hearing about an official launch for this one sometime in the future. When exactly, we’re not too sure, though we have heard whispers of a July release. Until then, we’ll keep waiting for more details to come from those seemingly loose-lipped Nokia employees. Think the intelligence services aren’t snooping on your private online data? Think again. Unnamed sources have supplied several leading publications with information purporting to show that the National Security Agency (NSA) and FBI have for the last six years been mining information from the servers of some of the world’s biggest Internet companies. However, since the Guardian and Post reported the story, several of the Internet giants have been quick to deny any knowledge of PRISM, which was launched in 2007 during George W. Bush’s presidency and continued under President Obama. 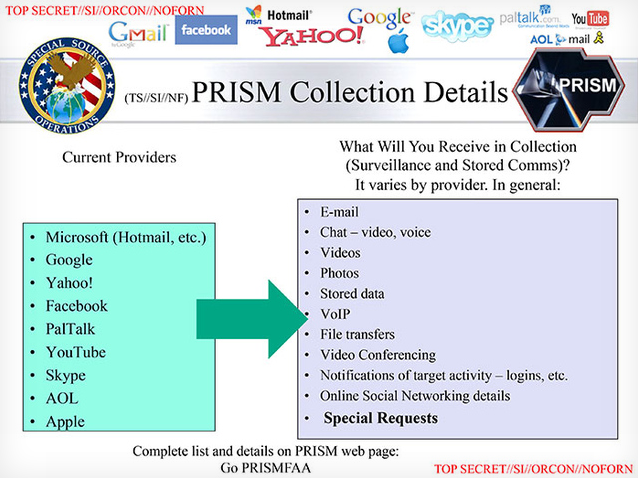 Of those who have so far issued statements, all are flatly denying that they provide agencies with direct access to servers, though the PRISM documents clearly suggest otherwise. The apparent depth and quality of material available to the intelligence services will shock many, with details and content relating to emails, images, video and voice chats, VoIP chats (eg. Skype), videos, file transfers, and social networking details all, it appears, available to the intelligence services. The news comes just a day after another Guardian report revealed an NSA order requiring Verizon to supply the government agency with data related to all calls made in the US over its network. Thanks to Tim Cook’s remarks about the wrist on Tuesday, anticipation for a so-called iWatch reached a fever pitch this week. Since Apple is clearly paying attention to wearable tech, I thought it would be interesting to see how Apple would approach a different opportunity: connected glasses. I’m not saying Apple will actually produce any in the near term – we’re far more likely to see that watch first – but let’s speculate on how Apple would compete with Google Glass. Google is an engineering-led company; it tosses a lot of products out in the market, listens to feedback, and modifies the products over time (or abandons them as failures, as often the case has been). Google Glass followed this formula by debuting as a very raw offering, earning it a pretty bad reputation before it was truly ready for prime time. Glass users are derogatively referred to as “Glassholes” which is hardly a term of endearment, or one that suggests high status. That’s a reputation that may keep all but the geekiest customers from buying the final version. Google’s ultimate goal as a company is to categorize information and serve up ads. 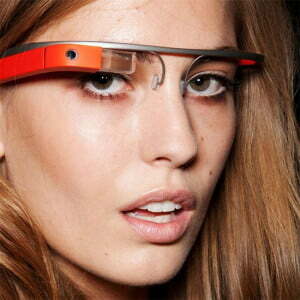 Glass is designed to do both, while also doing some things users think is interesting, like allowing them to read and respond vocally to email hands-free through the projected display. Google isn’t very focused on security, which is why Glass has already been hacked, and why many companies have apparently already issued policies banning them for employees. Not surprisingly, the idea of a camera on an employee’s head that can live stream whatever that employee sees upsets some security folks. While Google’s release-and-refine process gets product into customers’ hands quickly, selling such a crude product also subjects it to a lot of scrutiny at a vulnerable phase. Apple’s approach as a company is very different. Its team won’t let a product out before designers believe it is ready. This allows them to craft the best first impression possible, right out of the gate. When the product arrives, it’s polished, and more exclusive. Apple’s insistence on tightly controlling its products naturally makes them more secure, and the company takes potential security concerns more seriously. Apple would be less likely to put a camera on its glasses, or would at least provide visual notification for when the camera was operating. Otherwise, Apple would have to ban its product from its own campus. For Apple, the success of Android is a cautionary tale that shows Google can sometimes get things right enough. Apple seldom makes the first product, it just waits until it can do the first good product. With MP3 players, a variety of vendors beat Apple to the market, but by studying these competitors, Apple engineers perfected the iPod, which took the market by storm. The iPhone was far from the first smartphone, or even the first to rely entirely on a touchscreen – the LG Prada was almost identical in hardware. Apple just made massive improvements to the user experience, and – yet again – the iPhone took that market by storm. Apple’s first tablet came almost a decade behind Microsoft’s, because it took that long to develop the core technology that made the thin, light, and relatively inexpensive iPad work. And it took the market by storm. This suggests that iGlass is likely years off, but when it arrives, it will be better looking and backed by stronger services and experiences than Google’s offering, which is very likely to have died off in the meantime. This assessment doesn’t mean that Google can’t still lock up the market. The company has generally proven highly capable with Web services, and there is an inherent advantage to being first. If it can survive the painful birthing process, Google could own the market far before Apple is ready to enter. For Apple, the success of Android is a cautionary tale that shows Google can sometimes get things right enough. Apple glasses would likely be far more elegant and far less risky, but I’m starting to wonder if Tim Cook’s Apple can execute at that level any more. Steve Jobs’ Apple proved it could build a better product late in the game, but the jury is still out on whether that can still happen today. The Apple smartwatch expected later this year will very likely give us an answer. Until then, watch out for all those damn Glassholes! Who knows what those cameras are catching, and who is watching them. I suggest you be on your best behavior. Researchers at the Georgia Institute of Technology have developed a way to hack into iOS devices through a modified charger. Billy Lau, a research scientist at the institute, together with two Ph.D. students, will present a paper on this at Black Hat USA 2013, to be held in Las Vegas July 27 through Aug. 1. It took only 1 minute for an iOS device to be compromised after being plugged into a malicious charger. All users potentially could be affected because the team’s approach doesn’t require jailbreaking the device and does not involve any user interaction. The researchers built a proof-of-concept malicious charger they call “Mactans.” For this, they used a Beagleboard, which is basically a Linux PC a tad larger than a credit card. The researchers will describe how USB capabilities can be leveraged to bypass Apple’s security mechanisms, and will show how attackers can hide their software in the same way Apple hides its own built-in applications to avoid detection. Apple devs use Xcode to build OS X and iOS applications. Mactans was built with constraints on time and budget, and the researchers will discuss briefly what hackers with better funding and more time might be able to do with the concept of poisoning chargers. They will also recommend ways users might protect themselves, and suggest security features Apple could implement to help make such attacks more difficult. The Georgia Institute of Technology’s Billy Lau was not immediately available to provide further details. A Beagleboard is a low-power, open source hardware single-board computer produced jointly by Texas Instruments and Digi-Key. It was designed as a way of demonstrating TI’s OMAP3530 system on a chip. OMAP, or Open Multimedia Applications Platform, is a family of SoCs that process images and video for portable and mobile multimedia applications. They include a general-purpose ARM architecture processor core and one or more specialized coprocessors. The Beagleboard measures 75mm square. Its OMAP3530 SoC has an ARM Cortex-A8 CPU that can run Linux, FreeBSD, Risc OS or Symbian. Android is being ported to the CPU. The SoC also has a TMS320C64x+ digital signal processor for accelerated video and audio decoding, and an Imagination Technologies PowerVR SGX530 graphics processing unit for accelerated 2D and 3D rendering. The GPU supports OpenGL ES 2.0. The Beagleboard has separate S-Video and HDMI connections, a single SD/MMC card slot, a USB On-The-Go port, an RS-232 serial connection, a JTAG connection, and two stereo 3.5 mm audio jacks. It has 256 MB of NAND flash memory and 256 MB of RAM through a package-on-package chip. The Beagleboard uses up to 2 W of power and can be powered from the USB connector. With the Bring Your Own Device trend on the rise among enterprises, and the U.S. Department of Defense recently approving the use of iOS 6 devices in the military, as well as speeding up its process for approving mobile devices, the potential threat posed by a malware-bearing charger is very real. Another is to have chargers built to resemble Apple’s chargers and swap them for the real ones when users are not looking, though this is not a likely mode of attack except for very high-profile, high-value targets. “If you’ve got a specific target that’s worth a lot of money, spending US$50 on building a charger that looks like the real thing is chump change,” Abrams remarked. A third vector of attack could become available when a user borrows someone else’s charger for a number of reasons. “The kinds of radiation that someone going to Mars would experience are different from any radiation that we receive here on Earth, so we don’t have direct experience of what the health risks are,” says David Brenner, director of the Center for Radiological Research at Columbia University. Previous measurements of the radiation in space have been made outside spacecraft. Good luck enabled the new interior measurements, which were conducted with the Radiation Assessment Detector, a coffee-can-sized device attached to the Curiosity rover. Its designers intended the device to measure radiation on the surface of Mars, not inside the spacecraft that ferried it there. “We realized as we were getting ready to launch that we had this serendipitous opportunity to also measure the radiation environment inside the spacecraft during our cruise,” says coauthor Donald Hassler of the Southwest Research Institute in Boulder, Colo. The rover’s measurements confirmed predictions that 95 percent of a Mars-bound astronaut’s radiation dose would come from galactic cosmic rays. Humans are normally shielded from such rays by Earth’s atmosphere, so their effects on our health are unknown, Brenner says. Still, he says, the measurements are useful because they were close to theoretical predictions of radiation exposure.